This mat is Made with natural fibers. This long-lasting mat is finished with a secure, non-skid rubber backing that keeps the mat fixed in place. Dry wet feet, grab dirt, dust and grime! This doormat wicks away moisture for quick evaporation without an odor. These mats are beautiful, tough, affordable, decorative, sturdy and functional. Not many products offer that kind of value. 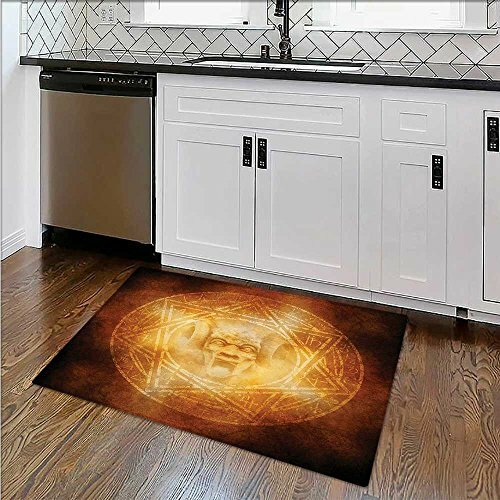 *Foot Mat Size: W30" x H18"
*Type: Polyester fabric single sided printing , non-slip. *High-density space elastic cotton interlayer, water absorption, soft to touch, fluffy and delicate, do not fade, the middle layer is a high-density memory sponge, effectively alleviate the feet pressure. *The bottom of the mat use non-woven cloth and plastic bottom, more anti-skid and durable. *Professional personalized DIY printing design, personalized custom, suitable for a variety of occasions. *Normally we will ship in 1-3 days according to your order status, and it will take about 1-2 weeks to delivery after shipping. *We always provide high quality service for the customer. Any question,please feel free to contact us. We appreciate every customer and every order is important for us and we will help you solve it actively. Thanks! Material: Made with natural fibers. PLACE BEFORE EVERY EXTERIOR DOOR - Perfect for front porch entrance shoe scraper absorbent decor office hall entry mat inside bedroom carpet home kitchen rug. MANUFACTURER FULL WARRANTY: With The Free Replacement Forever Guarantee, You Never Need To Buy doormat. So If It's Not Working, Or Fitting, Or Standing Up To It's Task, You Can Send it Back For A Replacement.